If we structured our pets’ diets based on the foods that their cartoon likenesses love to consume, it would look something like this: cats would gorge themselves fish and cream, dogs would eat nothing but peanut butter straight out of the jar, and rabbits would subsist solely on carrots. If you have a pet rabbit, you’ve probably had a friend try to slip baby carrots through the bars of their cage at least once. But should you let them? Bugs Bunny seems to do quite well on an all-carrot diet, but how would your real, flesh-and-blood rabbit do? Can you give your rabbit carrots? The answer may surprise you. Technically, yes, rabbits can eat carrots, but they should only eat them as rare treats, not as staples. Carrots and other vegetables are considered some of the healthiest foods that us humans could possibly eat, but for rabbits, they are more ‘delicious’ and less ‘nutritious.’ Feel free to give your bun a small chunk of carrot as a treat, but resist the urge to model their diet after Looney Toons characters—it turns out Bugs Bunny has been living on dessert! Though carrots are bunny candy, they are certainly more beneficial than actual candy bars. Carrots are full of beta-carotene, which rabbits can convert into Vitamin A. This vitamin is the reason why we always associate carrots with good eyesight; inside the eyeball, Vitamin A turns into one of the chemicals that helps improve night vision. Several studies performed on various animals have also found that beta-carotene seems to protect against the leading causes of blindness, macular degeneration and cataracts. That said, there are plenty of other sources of Vitamin A. Your rabbit will be much more suited to Brussels sprouts, spinach, carrot tops, or turnip greens. If you are concerned about giving them Vitamin A, you can make sure that most of their treats are orange—fruits such as apricots can boost Vitamin A, and they are safe in small amounts. In addition to their vitamin content, carrots have some unique health benefits. They are one of the few vegetables to produce an antifungal pesticide called falcarinol, which appears to protect against cancer. 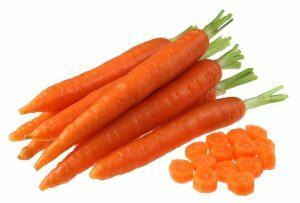 One study performed on rats found that those who ate carrots had 2/3 the cancer risk of rats who did not. Though rats have different dietary needs than rabbits, it is possible that some of these anticancer benefits may be universal. Carrots have one more weapon against cancer: antioxidants. These substances, which exist in almost all plant foods, are beneficial because they destroy free radicals. Free radicals are natural metabolic waste products, but they can have disastrous effects on the body if left unchecked. They are highly charged, which makes them extremely reactive—they alter the DNA in many of the cells they come into contact with. Some of these mutations are harmless, but others can lead to diseases like arthritis, heart disease, dementia, and, yes, cancer. If carrots have so many superfood properties, why can’t you give them to your rabbit in abundance? Unfortunately, rabbits are different from many other herbivores. While squirrels and other animals can do quite well eating carrots, fruit, nuts, and seeds, rabbits can’t handle high amounts of carbohydrates. Unlike other herbivores, rabbits meet most of their calorie needs by fermenting and digesting dietary fiber rather than more readily available sugars. 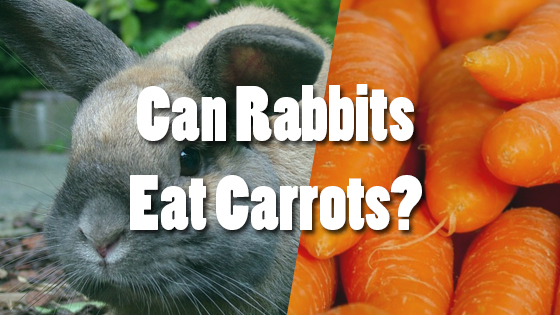 Carrots are low-carb by our standards, but in the context of your rabbit’s daily dietary needs, they are little orange sugar bombs. One issue with sugar is the increased risk of tooth decay. Because we usually do not brush our rabbits’ teeth, they rely on high-fiber foods to keep their mouth clean. Sugary, starchy foods like carrots can lead to cavities and other dental problems. One study in the UK found that eleven percent of pet rabbits had some degree of tooth decay. The reason rabbits eat so much hay is that they need all of that fiber to keep things flowing through their gastrointestinal tract. They have a special digestive organ called the cecum; this organ exists solely to ferment and digest the ‘indigestible’ fiber that would pass through the bodies of most other animals. If you feed your bunny too many high-sugar foods (yes, including carrots! ), they often will not get enough fiber to keep their digestive system working properly. The sugar sits stagnant in the cecum for too long, gives off gas, and actually alters the balance of chemicals inside their gastrointestinal tract. This can result in a variety of digestive issues, ranging from a single bout of diarrhea all the way to potentially life-threatening conditions like gastrointestinal stasis. In conclusion, though rabbits love carrots, they should only eat them for dessert. Eating too many carrots can result in an excess of sugar in their bodies, which can cause tooth decay, gastrointestinal problems, and even obesity. Your rabbit’s diet should mostly consist of hay and other fibrous, low-sugar foods. Can Cats Eat Ginger? Can Rabbits Eat Cabbage?